Imogen Cooper with the Australian Chamber Orchestra & Richard Tognetti; Alfred Brendel, the Academy of St. Martin-In-The-Fields with Neville Marriner; Wolfgang Holzmair; Sonia Wider-Atherton. Imogen Cooper, one of the world's most elegant pianists, showcases her artistry as instrumentalist, concerto soloist and chamber musician on this magnificent 3CD Set. 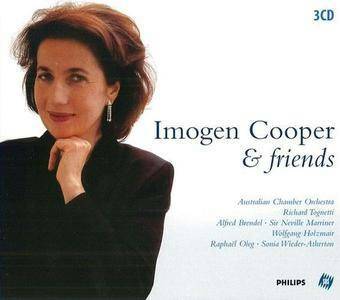 This collection is the first ever of Imogen Cooper's work and includes the first release of three Schumann songs (Clara and Robert) as well as the first commercial release of a 'live' recording of Mozart's B flat major Piano Concerto (KV 595) with the Australian Chamber Orchestra. Mozart: Concerto No.7 in F for Three Pianos & Orchestra, KV 242 "Lodron"